Yesterday my daughter again asked why I didn’t do something useful with my time. Talking about my “doing something useful” seemed to be her favorite topic of conversation. She was “only thinking of me” and suggested I go down to the senior center and hang out with the guys. I did this and when I got home last night I decided to teach her a lesson about staying out of my business. 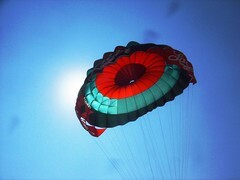 I told her that I had joined a parachute club. I proudly showed her that I even got a membership card. She said to me, “Good grief, where are your glasses! “I’m in trouble again, and I don ‘t know what to do… I signed up for five jumps a week.” I told her. This entry was posted in Jokes and tagged Business card, Humor, joke, Recreation, The Parachute Club. Bookmark the permalink.